To use the Mac’s built-in voice recognition software, you have to define its settings and then assign specific types of commands to your voice. 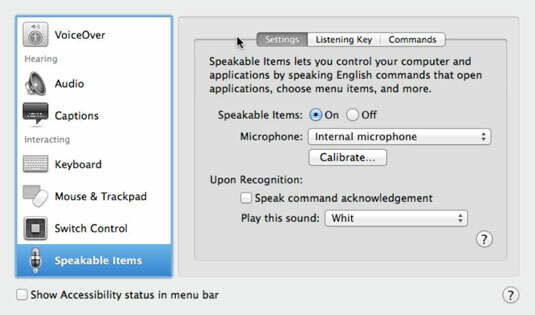 You define the Speakable Items settings to choose how to turn on voice recognition and how your Mac will acknowledge that it received your voice commands correctly. For example, your Mac may wait until you press the Esc key or speak a certain word before it starts listening to voice commands. When it understands your command, it can beep. 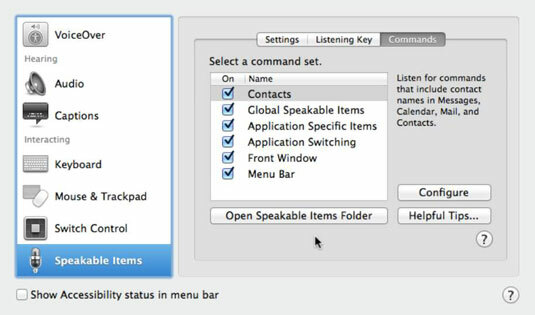 1Choose Command→System Preferences and click the Accessibility icon. Click the Speakable Items button in the left pane of the Accessibility window and then click the Settings tab, shown in this figure. 2Select the On radio button to turn on the Speakable Items feature. Choose an appropriate device for accepting your spoken commands from the Microphone pop-up menu. Internal Microphone would be an obvious choice here unless you happen to have an external microphone connected to your Mac. 3Click the Calibrate button to open the Microphone Calibration dialog. The button is shown in this figure. 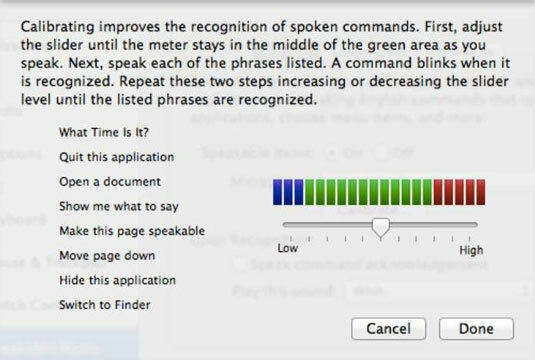 4Recite the phrases displayed in the Microphone Calibration dialog. If necessary, adjust the slider until your Mac recognizes your spoken commands. Each command phrase in the listing blinks when your Mac successfully recognizes your phrasing of the command. 5When your Mac recognizes all phrases, click Done. You will return to the Speech Recognition preferences pane. 6Click the Listening Key tab, and click the Change Key button shown. 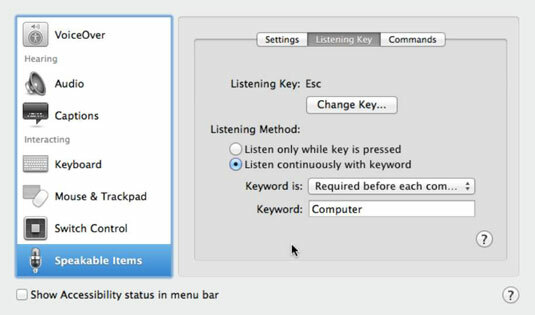 Pressing the Listening Key (Esc is the default) tells your Mac to begin listening for your spoken commands. You can change the default here. 7Press a key and then click OK to return to the Speech Recognition dialog. You might choose a key such as ` (the accent grave character) or one of your Mac keyboard function keys. Listen Only While Key Is Pressed: Your Mac accepts only spoken commands as long as you hold down the Escape key, or a different listening key you defined. Listen Continuously with Keyword: Your Mac waits to hear a spoken keyword (such as Computer or Yoo-hoo!) before accepting additional spoken commands. Optional before Commands: Your Mac listens for spoken commands all the time. This can make it easier to give spoken commands, but it also means that your Mac might misinterpret the radio or background conversations as commands. Required before Each Command: You must speak the keyword before your Mac will accept spoken commands. Required 15 Seconds after Last Command: You must repeat the keyword within 15 seconds after each command. Required 30 Seconds after Last Command: Same as the preceding option except the Mac waits up to 30 seconds for the next spoken commands. 10In the Keyword text box, enter your keyword if you don’t want to use the default keyword (Computer) to speak to your Mac. (Optional) Make choices in the Upon Recognition area (under the Settings tab). If you want your Mac to use the default sound (voice) Whit to confirm commands it successfully recognizes, select the Speak Command Acknowledgement check box. If you prefer to hear an alert sound rather than Whit’s voice, open the Play This Sound pop-up menu and choose the alert sound you want. 11Click the Commands tab to open the Commands preferences pane, as shown. Contacts: Listens for names stored in your Address Book. Select Address Book and click the Configure button to specify which names in your Address Book you want recognized. 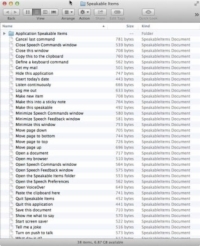 Application Specific Items: Listens for commands specific to each application. A word processor might have a Format menu, but an audio-editing application might not. Application Switching: Listens for commands to switch between, start, or quit applications. Front Window: Listens for the commands to control specific items in the displayed window, such as telling your Mac to click a button or check box. Menu Bar: Listens for commands to display pull-down menus and choose a command. 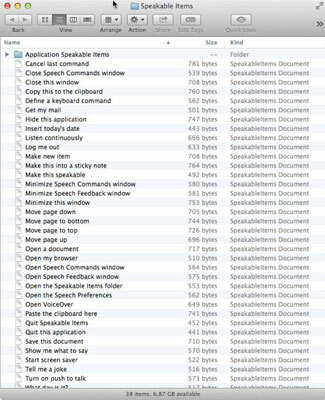 12Click the Open Speakable Items Folder to open a Finder window containing file icons of all the commands you can say to your Mac. This is a list of all the speakable commands you can use. 13Click the Close button or press ⌘+Q to quit System Preferences. You can also go on to set up other Accessibility functions.